Cleaning my makeup brushes is one thing that really annoys me, don't get me wrong I love it when my makeup brushes are all clean and pretty looking, but it's actually the cleaning process that annoys me, so anything that I can find to make that process quicker is a winner in my opinion and when Makeup Revolution recently released their new travel friendly Solid Brush Cleaner I just knew I had to give it whirl! The Makeup Revolution Solid Brush Cleaner* (£5.00) is a portable brush cleaner that provides effortless, no mess on the go brush cleansing. The formula is a white, hard balm that will instantly sanitise, cleanse and condition your makeup brushes and as the balm is compact into it's packaging it's mess free, you don't have remove anything, you just open the lid and use the balm inside the pot woohoo. In order to use the balm and get squeaky clean makeup brushes in seconds, yes I mean seconds all you have to is wet your dirty brush and gently place it into the solid brush cleanser giving it a swirl around until it starts to foam, this will then remove the dirty residue before your eyes super quickly, then rinse your brush under the tap and lay flat to dry. Once you've finished cleaning your brushes you will notice that the top of the balm will be slightly grubby and will probably have some makeup residue left on it, so all you have to do is just run the balm under cool water and pat dry with kitchen towel and the the balm will look like new again. I've honesty never used or come across a brush cleaner that is so quick and easy to use which is also portable, it's brilliant and would work so well for anyone who switches up their eyeshadow looks regularly but only has a few eye makeup brushes in their collection or if your going away on holiday an only want to take a couple of brushes with you, this balm is the easiest way to get your brushes clean when you switch between shades! I've also tested this out with my beauty blender and it worked really well with that too, I basically used the same cleaning process as I do with a makeup brush and it was like new again! 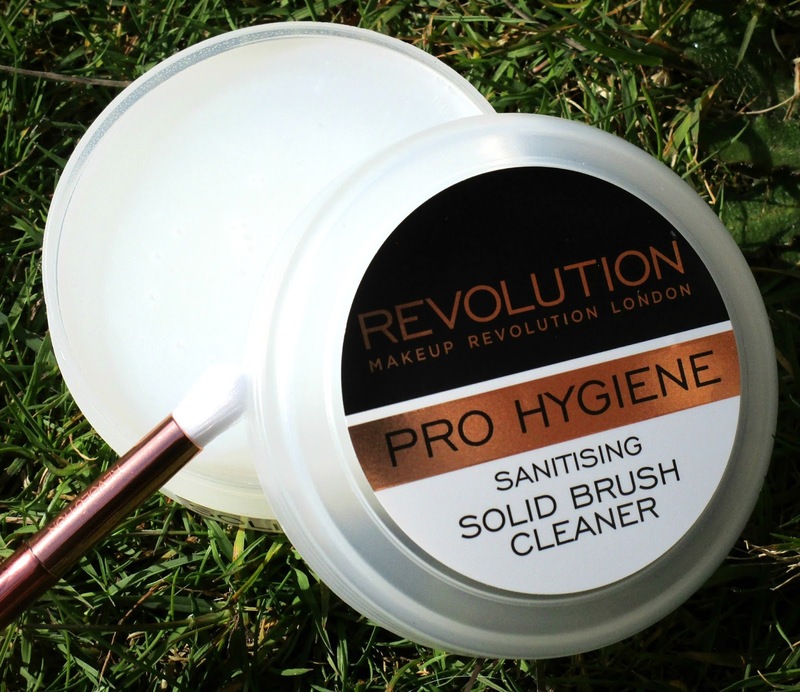 Have your tried the Makeup Revolution Solid Brush Cleaner yet beaut's? What did yo think? I'd love to know! This sounds fab. I've been meaning to pick up the Beauty Blender balm cleaner but this is a much cheaper version. I haven't ordered anything from MUR in ages!! Eek, I need this in my life. On first impressions I would have expected the balm to get manky really quickly and then to be quite unhygienic - but if it's easy to rinse the balm itself then I'm onboard! This sounds amazing and its so cheap! I am absolutely loving this i was sent it a few weeks back and it really does speed up cleaning brushes!